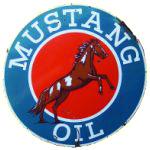 This service station sign features the antique “Mustang Oil” brand name and logo. The sign is a circle with a blue border and red center. The picture of a bucking mustang is in the center of the red inner circle.